NOTE: the rhubarb was not fully ready for picking and strawberries were still green on the vine when we made this. We substituted blueberries and sliced pears and it worked beautifully! Spread the almonds on a small baking sheet and bake until lightly toasted, 4 minutes or so. Remove and set aside. Increase the oven to 400º. Make the almond flour by pulsing the COOLED almonds in a food processor or grain attachment of a blender until they are like sand- careful you can easily turn this into almond butter. Melt the coconut oil in a large sauté pan over medium heat. Brush a 10″ solid-bottom tart, pie or cake pan or skillet with a bit of the melted coconut oil. Soak the dates in the coconut milk for about 30 minutes prior in a blender. After 30 minutes, blend until the dates are pureed into the coconut milk. Add the eggs and egg yolks and blend for just a few seconds until well blended. Add the salt and vanilla. 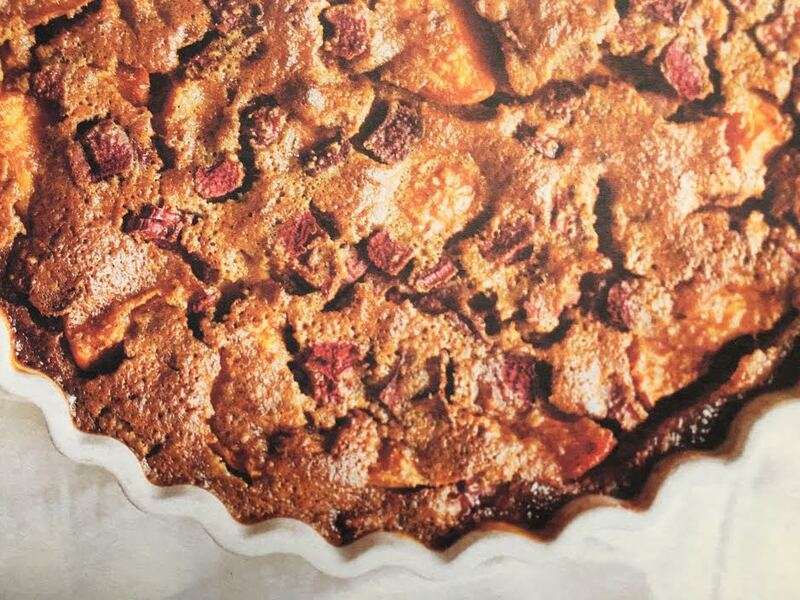 Place the rhubarb in a pan over medium heat and cook for about 5 minutes, giving the pan a gentle shake occasionally to be sure it’s not sticking. 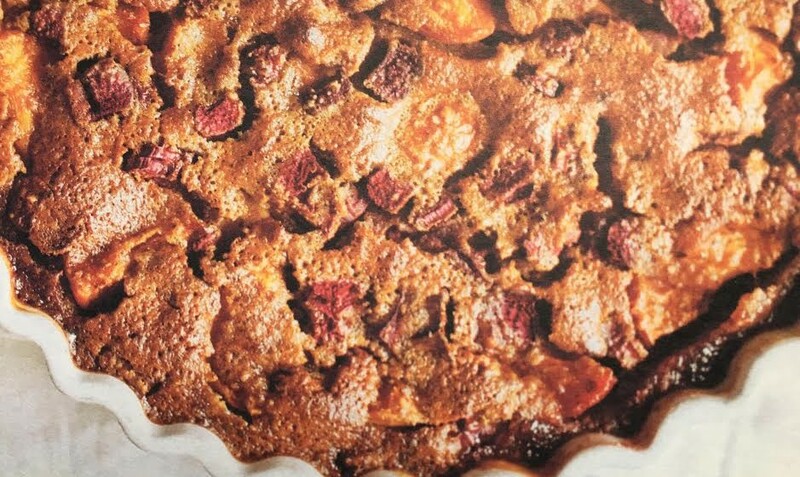 Move the rhubarb to the baking tart pan or cake pan and add the berries. In a large bowl, put the almond flour in a bowl and pour in the coconut milk /date mixture and the egg mixture. Mix well. The consistency will be that of a thick crepe batter. Pour the batter over the fruit. Scatter the almonds over the top. Bake the clafoutis until puffed and golden and a toothpick inserted near the center comes out clean, 40 – 50 minutes. Remove and let cool at least 30 minutes. Serve warm or at room temperature. Peel and core the pear and slice it to about 1/8th of an inch thick slices and arrange it on the bottom of the baking dish. Scatter the fresh or frozen blueberries around and on top of the pears.